LANSING — Four groups that are consistently among the top campaign spenders in Michigan are sitting on a strikingly massive amount of money for this early in an election cycle. As of Oct. 20, 2017 — just over a year before the 2018 election — those four committees reported having a combined $6.48 million available in their accounts. That total is about $3 million above the previous high they posted by Oct. 20 the year before the last five gubernatorial elections where all 148 seats in the Legislature were on the ballot. 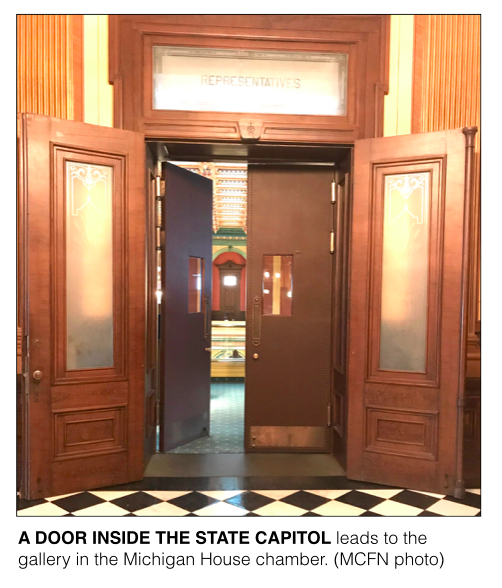 The four committees represent the main fundraising account of each of the four legislative caucuses in Lansing: the House Democratic Fund; the Senate Democratic Fund; the House Republican Campaign Committee; and the Senate Republican Campaign Committee. Lawmakers continually work to raise money for their caucuses’ committees. 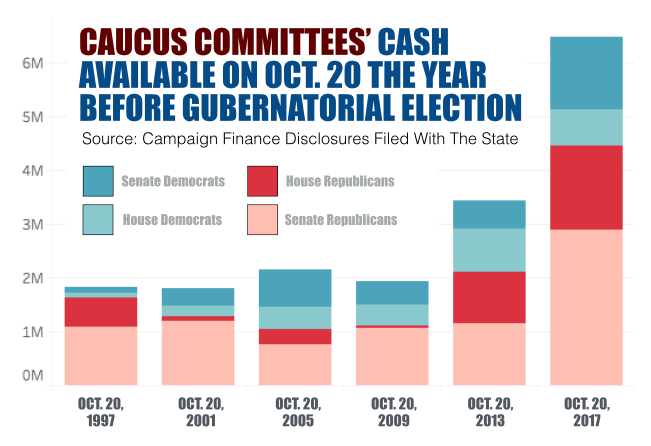 The committees had to turn in new campaign finance disclosures on Thursday. They use the money they raise to fund advertisements, staff and mailings in the most competitive races for the House and the Senate. Individual donors can give up to $40,000 per year to a caucus committee. Lawmakers voted to double that contribution limit from $20,000 in the fall of 2013, likely one of the reasons the caucus committees have been able to raise more money this cycle. Helping drive the numbers upward is the House Republican Campaign Committee. House Republicans won a 63-seat majority in 2016 (Democrats won 47 seats). Already in 2017, House Republicans' main fundraising committee has brought in $1.6 million. The committee had $1.5 million still available to spend as of Oct. 20, 2017, according to its campaign finance disclosure. Compared to past cycles, its previous high for money available on Oct. 20 in the year before a gubernatorial election was $952,191 in 2013. The House Democratic Fund has raised $853,310 so far in 2017 with $674,400 available as of Oct. 20. House seats are up for election every two years. Senate seats are up every four. So the Senate Democratic Fund and the Senate Republican Campaign Committee have been storing up money for 2018 since the end of 2014. The Senate Republican Campaign Committee has raised $1.1 million so far in 2017 and had $2.8 million available on Oct. 20. It’s previous high total in recent cycles for money available at this point was $1.2 million in the 2002 cycle. Republicans currently hold 27 of the 38 seats in the Senate. The Senate Democratic Fund has reported raising $516,102 so far in 2017. The fund reported having $1.3 million available as of Oct. 20. It’s previous high in recent ycles for money available at this point was $700,715 in the 2006 cycle.